Very quietly, California State Senator Ted Gaines has issued Senate Bill 40 that would limit his state’s $2,500 plug-in rebate to only those cars with a MSRP of $40,000 or less. Out would be the likes of the Tesla Model S, BMW i3 and Mercedes-Benz B-Class Electric. Given that there is a limit as to how much money California has to fund the CVRP program (theoretically anyway- it has been raised many times), the sentiment makes some sense. Rebate money would indeed go further in its purpose to get more plug-ins on the road by only being available on those EVs where the money would defer the greatest percent of cost. The thing is, this is basically a bill to eliminate Tesla Model S owners from receiving the credit as the other players in the high end plug-in business are relatively insignificant. 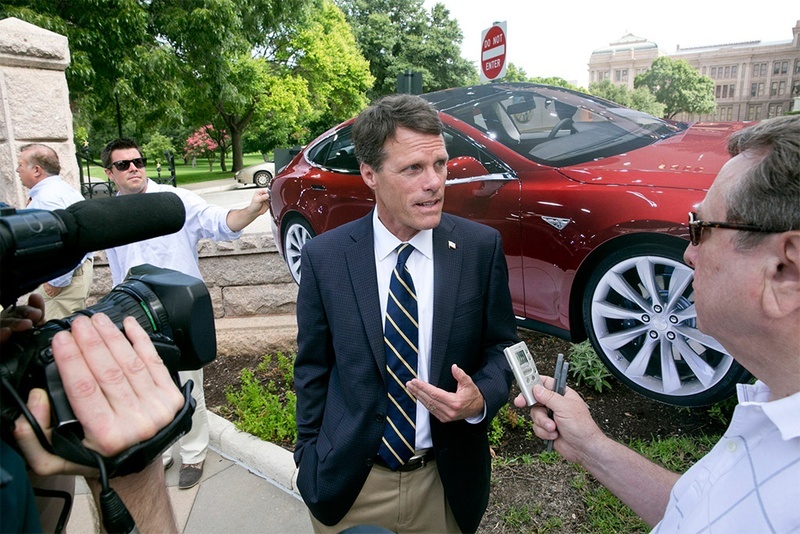 Adding to the drama, Senator Gaines had been the biggest Tesla support in the California government…that is, when he was looking for a certain Gigafactory project to come to the state, and more specifically to his home district of Sacramento. So, are sour grapes in play here as well? Now some six months after losing the battle for Tesla’s Gigafactory to Nevada, this Bill would seem to indicate Mr. Gaines has harbored some ill-will towards the company since then…or perhaps he has merely had a return of his sensibilities to look out for the common good of his constituents. Although, it seems fairly hard to believe that if Tesla had been chosen to make batteries in his home district that this bill would still be tabled today. Through February of 2015, the CVRP program has issued 13,597 rebates to Tesla vehicle owners worth $34,246,361. The reason for Mr. Gaines forwarding this bill not withstanding, would the public had been better served to have these funds reserved for the “middle class”? Would future funding be better allocated towards strictly lower cost plug-ins? That is still the real question. 89 Comments on "California State Senator Spurns Tesla, Calls For Limiting State Rebate To EVs $40,000 Or Less"
Well, I can’t fault his political ideology. It’s certainly true that those who can afford a car with an average price of nearly $100k aren’t people in need of a government subsidy. But better would be a direct rebate which would be paid to the buyer, regardless of how much he pays in taxes per year. The current setup really -does- tend to reward the rich more than the middle class. Simply ending the indirect subsidy for Tesla, the company that is leading the EV revolution… the one that’s creating a push for other auto makers to make EVs… would be a mistake. True. Making it dependent on taxable income is more of a hit to the middle class than allowing $100K cars to be allowed. Step 1 is making it a point-of-sale rebate. However, CA would have to make sure they have the funds for this, since this would probably increase EV sales significantly. You’re thinking of the federal rebate for EV’s (up to $7500) which is a tax rebate. The California rebate ($2500) is direct to the consumer, is NOT tied to taxes or income and is delivered in about a month after submitting the form. Is that the same way Georgia & Colorado are set up? what they (apparently used to) do in illinois is to give you a 10% rebate on up to $40,000. the rebate amount was based on the actual price paid and not on the msrp. so i think that a better way to implement the plan in california is to limit rebates to cars where the price paid was less than $40,000 (based on the price listed on the sales invoice). that way the state need only look at the papers submitted by the applicant for rebate and would not have to monitor msrp’s for various automobiles. Agreed that the out-the-door-price less govt. taxes and fees makes more sense, as otherwise we’ll be seeing automakers and dealers imposing $5k fees for destination charges and $1k for paperwork fees. And fully agree with the idea – we’re past the point where we should be subsidizing cars for people who don’t need it – we need to drive the prices down to where the rest of the population can consider them. But allow the price limit to float, depending on the range. I like having a lower basic selling price limit, but let the selling price increase one dollar over the limit for every 1 mile of EPA range beyond 100, to a maximum selling price of $40k. And have the limits increment down every year by $500 or $1,000. Finally, let people choose _either_ the HOV stickers OR the rebate. Anyone who can use the stickers will opt for them, because the payback in time saved is much higher than the rebate amount. Yes, you absolutely can fault him for being an pandering, short sighted, fool. The incentives are for encouraging clean transportation and as hand out limited to a certain segment of the population. Does the dingbat or anyone eschewing this mindset think that manufacturers would intentional only build expensive cars for only the rich to take advantage. Batteries and new tech are fricken expensive, no way around it. Manufacturer’s are better incentivized to produce lower cost version since the same dollar credit has a larger percentage savings impact for the consumer or for them manufacturer to able to sell higher volumes. If they want to change the credit then make it progressive for the estimated gas consumption displacement based on the average economy of the corresponding ICE vehicle. That would be a changed actually aimed at improving the program and not pandering to some weak minded people. The Tesla strategy will eventually benefit the middle class…patience is needed today. It directly benefits the middle class now. 1) Less pollution as these cars replace gas guzzler Jags, etc. 3) Lower demand for gas means lower gas pump prices in the highest gas priced state in the nation. Folks who can afford 100K cars are also the ones paying more taxes. Why should they be disqualified to get some of their taxes back? Should government exclude someone because they worked hard and financially succeeded? Putting aside losing the Giga to Nevada, the California Tesla factory is arguably California’s most significant hard product manufacturing plant employing thousands (and growing) of “middle class” California residents. I wonder to what extent Senator Gaines has plugged that into his calculus of better helping the California “middle class”? Yup…I’m thinking its sour grapes (hurt ego) at the cost of California middle class auto workers. If people can afford a $100k car (come on, who really buys a base model ‘S’), they really don’t need the $2.5k incentive (or 7.5k federal credit for that matter). It’s just the rich getting richer. I would also suggest upping the federal tax credit to 10k (and make it a POS rebate), and limit the rebate to EVs with MSRP $40k and below as well. That would also encourage manufacturers to hit a target MSRP of <$40k, so their EV would be eligible for state/federal incentives, instead of pricing the vehicles at whatever they see fit. If it was me I would have it at $30,000 it would force other car company companies to cut their prices. Besides when you buy a $100,000 car a $2500 isn’t really going to make or brake it. Start at 40k and then reduce the threshold every year by 2.5k. Create an incentive for the car maker to sell to the masses. what would really encourage auto makers to sell *EV vehicles for less money is lower costs, not rebate incentives. auto makers already know that the likelihood of higher sales volumes is increased by lower prices. i do agree that the $40,000 cap is sensible because price sensitivity decreases as price increases; so, as noted by others, people who are going to spend “luxury car” money on a car are going to do so, rebate or no. the people who are more likely to be influenced by rebates are those who are stretching their budgets to buy a car; but such is irresponsible behavior that should not be encouraged by governments. There are plenty of wealthy LEAF owners out there- especially those that bought the car right when it was released. Please explain how the $2,500 rebate is a good idea for a wealthy LEAF owner, but a bad idea for an equally wealthy Model S owner. The purpose of the $2,500 rebate is to encourage the purchase of zero emission vehicles (especially vehicles that can completely replace conventional vehicles instead of just being used solely for commuting). If the incentive is less effective for wealthy buyers then phase it out above a certain income level. the Leaf is a second car, and as second cars go, it is quite expensive, so you would expect buyers to be of higher incomes. but then there are cars like the Volt, that also get the rebates but are designed to be practical to own as your only car. so it makes sense to set the target at a level that really would befit the price range of middle-income auto buyers. to the extent that *EVs achieve general market acceptance, i would expect that middle income buyers would bias much more strongly toward PHEVs than they would BEVs. in that case, the rebate achieves its purpose because the greater volume would be toward PHEVs. We looked at the Volt at the same time we were considering the Model S and the Volt didn’t have enough cargo and passenger capacity to be our only car. The options we were interested in would have also pushed the MSRP above $40,000. So a $40,000 MSRP cap would have steered us away from the Volt as well as steering us away from the Tesla. +1 Senator Gaines. Let’s keep it real. The average person don’t buy a car for over $40,000. I think these rebates serve two purposes, one is to promote alternative fuel vehicles, and the second is to make them more affordable for those who probably wouldn’t buy one otherwise. I totally agree with his proposal (bill). I know a local musician who waited about 3 years before they could afford their Nissan Leaf. On Lease. They simply could not afford to buy at the initial model year prices but were fervently a pro-EV family. They finally got their budget price and got in the EV because they truly dislike the oil cartel and all that surround it. Good for them. This is the type of person who needs more support. I recently read a note on a Tesla board from a guy who’s handle was Richdoc who ordered a Tesla. I can imagine this “Rich Doctor” or whatever their handle means doesn’t need the $2500 rebate. By the way, such a rebate is usually taxable income via a 1099 form. So, it is somewhat less valuable in the end. Only if you don’t understand the IRS code. Should I have ripped up the 1099 that I got from my own state’s rebate program? I guess that’s fine to avoid tax laws. I bought used for that very reason. For the vast majority of the country, cars over $20K are just not affordable. Tesla’s “regional orbit” has fired up business in the Bay Area. And Tesla’s presence (SpaceX too) in California has reminded the world that Silicon Valley innovation extends all the way to heavy industries. Don’t mess with a good thing. In fairness, Cadillac, BMW and Mercedes also sell plug-in cars with a price above $40,000. It would still be far more interesting if they set the cap at $20,000. Isn’t the radio upgrade in the MS $2500? This is a small price to pay to keep an already bankrupt state from going “bankrupter”. Maybe the ceiling should be $35K to keep the major automakers on the ball to deliver affordable plug-ins. He is leaving the door open for Tesla’s $35K Model 3 dream machine. It will be $35K, right Tesla? Hope so because it has to be affordable for the masses. Rebates are supposed to help those who need help. But sure, I also believe that millionaires still use coupons at the retail grocery store. It’s how they became Millionaires in the first place – by not spending all their money. CA no where near bankrupt, except on Fox News. It is going to play out. Just look at CALPers, story from April 2014… When the people have a limited supply of pension funds, they consider leaving the state. What is left to fund the state are “hot” companies in the valley or LA and tax base of wealthy individuals sticking around. The California Public Employees Retirement System (CalPERS) just admitted that the state-managed pension plan, that provides retirement for the state and almost 1,600 local government agencies, is 52% underfunded and will be forced to jack up taxpayer-funded contribution rates by about $1.518 billion. Hmmm, maybe limit the rebate to vehicles manufactured in Cali? How about limiting them to cars made in the poorer areas of California, such as central valley? Instead of the wealthy areas in/around Silicon Valley, where the multi-millionaires live. Set up a factory in the high-unemployment, poor districts around Bakersfield and Fresno. Why do this half way? The free cars can be funded with a tax on new purchased cars. After all, if you can afford to buy a new car, you can afford to pay your fair share. Said the Republican states that live off Blue State Taxes. Since there aren’t any affordable 200 mile range EVs on the market, we decided to stretch our budget and get a Model S. We wouldn’t have made the purchase without the $2,500 rebate. And since we put a lot more miles on the car (48,000 miles and counting) than we would have with a shorter range sub $40,000 EV, I think California got their money’s worth in our case. Maybe some EV drivers are so wealthy that $2,500 makes absolutely no difference to them. But simply putting an arbitrary $40,000 MSRP cap on the rebate until there are better sub $40,000 EVs on the market will result in fewer EVs on the road which seems counter productive. i would say that you should not have stretched your budget for a car, in which case, denying the rebate for cars over $40,000 would have the additional benefit of discouraging people from engaging in irresponsible decision making. you, of course, have a right to set your own priorities, but those priority decisions should probably be no more encouraged than should the government encourage people to smoke or drink alcoholic beverages. I’ve been extremely happy with the car. And we didn’t endure any financial hardships due to the purchase so perhaps “stretching the budget” wasn’t the proper choice of words. But $2,500 less in rebates would have been enough to call off the purchase since I almost didn’t go through with it when the $2,500 price increase was announced in late 2012. But I got the refundable deposit in before the end of 2012 to guarantee the price and had enough saved up by the time the car was in production. If we are to have any hope of reducing CO2 and energy use, the government needs to target incentives to smaller, lighter, slower vehicles. “Cars” have never made sense from a scientific standpoint. How do they cut CO2 while also wanting people to have more children who cause more resource burn and CO2 production? How about removing the child tax credit from the IRS? Might it help people make smarter decisions on family planning? The senator clearly doesn’t understand the economics of bringing a new technology to market. Limiting the rebate to the low end of the market may sell more 80 mile range runabouts but it will do nothing to push the technology faster toward long range BEVs capable of replacing ICE. I personally am middle class and have been working crazy hours and saving money over the last few years to afford an extended range Model 3. It will certainly be more than $40k and will end up being 3X more than I have ever spent on a car before. Why should I not be eligible for the rebate? I must have been under the mistaken impression that the intent of these rebates was to facilitate the faster introduction of a new technology (zero emission EVs) that are capable of replacing ICE in large numbers. If that is the mission then I would rather see more tax dollars go to a company like Tesla than GM or some other existing automaker. It seems many here are suggesting it be a form of social welfare instead. Ditto! If the senator really wants to limit its use by the rich, then limit the rebated based on AGI instead. After all, there are many deductions on the tax forms that are based on AGI, the EV tax rebate can simply be one of them. I agree. Setting the limit at $40k will kill off any 200 mile EV. If you add a couple of options, all of the planned 200 mile EVs will easily be over $40k MSRP. Heck even an 80 mile Leaf SL starts at $35k and can be optioned up to $38k. If they did this at the federal level (as others have suggested), this will kill any momentum the 200 mile EVs would have had out of the gate. The 200-mile car is not far off. $30K price point after rebate. So, that is under $40K MSRP. I am not american so probably i can be wrong but i feel Senator has valid point. Infact he can add a sweetner that for less than $40000 the rebate will be $4000. If the rebate cap is moved to $40,000, cars that are “optioned out” and end up costing over $40,000 will not qualify for that rebate. Assuming the specific price is the price of the car before delivery (which is a federally-mandated charge) and sales tax (which is also federally-mandated), and the base price is indeed $35,000 – that allows for a Model 3 to have its tech package and not much else before it hits $40,000. There are still a lot of people for whom this is a lot of money to spend, and the $2,500 will control what options they go for, so you may see a lot of similarly-equipped cars in California. But as far as Tesla goes, California is just one small fraction of the world market, and this change won’t affect them much. The subset of Californians who are now “scared away” from the Model 3 because their fully-loaded configuration no longer qualifies for a $2,500 rebate will be replaced by other buyers around the USA and world. Tesla won’t notice any difference. So in principle… it’s better for California, whose coffers won’t be so empty. I don’t see why a tier can’t be used. Unfortunately, the easiest way to make a cheaper EV is to put in a smaller battery pack. That’s counterproductive; a limited electric range means fewer gasoline-powered miles would be replaced by electric-powered ones. It also means the battery pack would wear out quicker… leading to even fewer EV miles driven. What makes the most sense is simply a fixed amount given as a rebate for the purchase of -any- plug-in EV. If we must have a sliding scale, it should be on the basis of how large the EV range is. Or just add a 2nd sliding scale. 1. EVs are promoted by the California government to advance the important policies of reducing green house gases, making the air cleaner for Californians to breath, and spurring Californian EV technology development and manufacture. 2. The government has enumerable policies to advance the interests of income inequality through various modalities of social engineering. 3. Government should not conflate the two set of policies, as one set has no direct link to the other set. This proposed legislation seeks to link the two sets of policies. That makes it a bad idea. Cutting off the rebate at $40k is stupid. Plenty of lower-income or average-income earners are saving up hard and working overtime for a Model S; why shouldn’t they be allowed to claim? If we’re going to see EV’s in abundance we need to encourage buyers of all dispositions, from city car drivers all the way up to those who have zero interest in a slow EV. I’m not proposing any ideas as I don’t know how the U.S. system works. I’m merely thinking out loud. i assume that you are joking about the ” plenty of lower-income or average-income earners are saving up hard and working overtime for a Model S”; because if you’re saying that there really are “plenty of lower-income or average-income” people who are sacrificing to buy a $100,000 car, then those are some *really* stupid people. The base price of a Model S is significantly below $100,000. Especially after the various incentives. Some people who put in their reservation before the end of 2012 bought the now discontinued 40 kWh Model S for $49,900 after Federal tax incentives (and $47,400 after state and Federal incentives if they lived in California). $50,000 isn’t cheap. But it also isn’t $100,000. Thus repeatedly referring to all Model S’s as $100,000 cars isn’t correct. Do you think “lower income” or “average-income” people would qualify for the full $7500 federal incentives? Let us be real here. If low income people are buying Tesla, they certainly got their priority wrong. And I don’t want my CA tax money go to those “stupid” people even though they are doing the “green” thing I agree with. That doesn’t really tell you anything of value, as the Prius is in the top 2 of cars owned for all of the most expensive zip codes in the state. So Tesla buyers appear to be more likely to have been Prius owners than the general car buying public- even in California. I don’t have an exact market share of the Prius in the wealthiest zip codes- but simply being number 1 in the wealthiest zip codes doesn’t actually tell you anything if it’s also the top car overall in California. Do you have exact numbers to show that Model S conquest sales of Prius’s can be completely explained by income level? as i recall from an article that i read on this website, the median household income for *EV owners surveyed was nearly $125,000/year. even if you buy a Leaf, you are buying a very expensive second car, so you would expect incomes of EV owners to be rather high. In that context, it makes perfect sense that the #1 conquest vehicle of the Model S is the Prius, as wealthy people in CA already prefer to buy cars with “green street cred” (which, not coincidentally, explains why the Prius has steadfastly maintained its hideous-but-distinctive look). Whose hand do I need to slap for the Photoshop abonimation at the top of this page? Is that supposed to be his Tesla cardboard cutout? It actually is his cutout, but it does look like a photoshop doesn’t it? what are you talking about? the article said that gaines went to texASS with a cutout of a tesla to underscore that there were no tesla showrooms in texASS. the photo looks like gaines standing in front of the texASS state capitol building. I think the idea was to reduce emissions. CAVP stands for Clean Air Vehicle Program. So how does lowering the cost at which a vehicle qualifies for the rebate coincide with the original intent of the program which was to get more low or no emission vehicles on the road? It simply doesn’t. Gaines is my state Senator and he’s been on the money on many things, but I think he misunderstands the rebate incentive process related to energy and environment. Many utilities (including publicly-owned municipal utilities and even)provide rebates for installing high efficiency AC units, replacing windows, insulating attics, etc. This is universally a policy to “encourage” energy efficiency and cleaner air. I don’t think I’ve ever heard anyone complaining that it isn’t fair that the McMansion owners get the same rebate as the hovel owners, even if the McMansion owner received a larger rebate for their 10 tons of high efficiency AC vs 3 tons at the hovel. You by an EV, you get your rebate. doesn’t matter if it is a $200K car or a $10K car or if you make $1M/yr or $20K/year. This could also be an attempt to step up Tesla Model 3 production to make Teslas available to the masses. The rebate is to get more alternative fuel vehicles on the road. The incentive helps buy the $70k+ vehicle to drive down the overall costs – mainly the battery. More manufacturing in Cali for the Cali based company. More jobs for the middle class. On naked political grounds, I’d leave it the way it is considering that Tesla now runs the biggest manufacturing facility in all of California. He is not a California Senator. He is a California State Senator. Understand these so called incentives are really an indirect payment to the car maker; a $3,500 rebate allows the car maker to increase his EV car price by that amount, $3,500; and, that increases his margin by that amount. With a state rebate of $3,500 and a Federal tax offset of $7,500, that increases a car maker’s margin by $11,000. Contrary to what some believe the incentive is not a gain for the car buyer. It really make no difference to the buyer, it’s a pass through to the car manufacturer. This politician is a Republican in a Republican safe district and a Democratic state…no chance of passage unless the Democrats say so. He’s just after media attention playing to the base… I live in the district. of course, the other side of the coin on this is that without the $11,000 the automobile maker may not make the car. if makers of *EVs were clearing over $11,000 per car in profit, they would reduce the price to sell more cars. if an x% price decrease results in y% increase in sales volume (where y>x), then you are better off selling at the lower price. Tesla is volume constraint. And has a net Marvin target to reach in order to find the model 3. Decrease the price or volume, and we have to wait much longer for a compelling mass market ev. No. The incentive is about getting proper plug-ins on the road. People buying Teslas are buying from a company that actually has growth of ZEV in its mission statement, has built a very significant network of charging stations that allows people to park a guzzler and travel long distances, and is also heavily focused on producing cheap static storage, which will help increase renewables. Mr Gaines, if you want to reform the rebate, try upping the minimum qualifying range and performance so that PiPs get nothing. This seems like extremely short sighted. Cut the incentive when the market is mature not in development. The more model s sells now, the faster we get model 3. And thus pressure on other manufacturers to rush their plans. So far everything is all talk. What is this guy doing? Politics. That’s what. This seems like extremely short sighted. Cut the incentive when the market is mature not in development. The more model s sells now, the faster we get model 3. And thus pressure on other manufacturers to rush their plans. So far everything is all talk. What is this guy doing? Politics. That’s what. So why is he in office? I thought California loves tesla. The politician is so transparent. Why don’t you increase the bar for what can be considered an EV. a hybrid that give me 30miles on a charge will nothing more than an ICE with a big battery for AC. But this article is bang on. This politician is crooked and a sore loser. I bet u GF deal had some other under the table requirents too and I’m not he didn’t win. Petty dude. There is a long list of “rich” plugins coming. From Volvo XC90PHEV to BMW X5 PHEV to Tesla to BMW i8 to Cadillac ELR. None of them should get the California incentives. This might even push BMW to lower its i3 price. I think $40K is a good limit. People who whine about this against Tesla can just shove it..
More people can afford the lower priced models. Sure, a few Tesla buyers might stretch b/c they are stupid. This will eliminate the few idiots. But it will give more opportunity to those who can only afford the lower price models. The demand will create a larger market and forces automaker to cater to that lower price segment. I would support this bill in my home state. if you add to the ‘equation’ “standing up for the little guy” against (LOL) “standing up for the rich people” RE getting re-elected, this is anything but a surprise, let alone worthy of most of this rich vs poor debate regurgitated here..
WTF is wrong with making the rebate available to EVERYONE irregardless of income!